Newsmotion is a civic media, public art and documentary storytelling initiative. 568 backers pledged $41,338 to help bring this project to life. WHYRecent events—including the uprisings in the Middle East and the Occupy movement—have shown that individuals and communities with access to technology are able to get their voices heard. A collective vision for the future of civic media is already being realized in revolutionary ways—Newsmotion is our contribution to this movement. The project is formed in partnership with Peoples Production House, a non-profit international journalism training and production institute with 10 years of experience bringing unheard voices to the fore. PPH’s team includes Carlos Pareja, Training and Policy Director; Abdulai Bah, Program Associate; Sylvia Guererro, Youth Media Director; and Anjum Asharia, Newsmotion Project Coordinator. Provide open source technology tools that ensure reliability, accuracy, and ease in accessing important information and compelling stories. Newsmotion’s ‘Originator’ tool authenticates sources and delineates them by category (Official, Unofficial, Citizen) in multiple languages, and in real time. ‘Reticulator’ is a tool designed to network and reward citizens for accurate and effective reporting and storytelling. Support media literacy and democratic media policy, ensuring a free and open global communication network. Julian Rubinstein, Series Producer, is an award-winning independent journalist, author, producer and adjunct professor at Columbia University's Graduate School of Journalism. Marisa Jahn, Creative Director, is an artist, writer and community organizer who was an artist-in-residence at MIT’s Media Lab in 2009-10 and is currently Executive Director of People’s Production House, an international non-profit journalism training and production institute. Natalie Jeremijenko, Senior Producer and Technologist, is an Australian-born artist, engineer, and NYU professor described by Fast Company magazine in 2011 as one of the most influential women in technology and by Wired magazine as “one of the three or four most dynamic people on the face of the earth.” Alan Chin (Facing Change Documenting America) is an award-winning Photographer and photo editor; Elizabeth Rubin, Senior Producer, and International Editor, a Harvard Nieman Fellow, who has covered the wars in Afghanistan and Iraq for The New Republic, The Atlantic Monthly and The New York Times Magazine, for which she is a contributing writer. MIT Media Lab technologists Matthew Hockenberry (Director, Sourcemap Foundation; Visiting Scientist, MIT Center for Civic Media) and Connor Dickie (2011 Mozilla Foundation Fellow); Mike Edwards (IT Systems Designer, Museum of Natural History) and Jonathan Bourland (Founder, Major Robot). Our advisors include Pulitzer Prize-winning author, journalist and Columbia University journalism professor Dale Maharidge; journalist, professor, author and chair of the PhD program in communications at Columbia University, Todd Gitlin; Academy Award nominated documentary film director and producer, Laura Poitras; Nitin Sawhney, Ph.D, research affliate with the MIT Center for Civic Media and Assistant Professor of Media Studies at the New School for Public Engagement; Editor-in-Chief of Digital First Media and former executive editor of washingtonpost.com, Jim Brady; co-principals of the International Information Policy Foundation, K.J. Wetherholt and Graeme R. Goldsworthy; Matthew Guma, agent, business adivser, and entrepreneur; essayist, author and creative strategist, Joshua Wolf Shenk. We are at a critical moment in the life of this project. We have presented our prototypes at MIT’s Center for Civic Media, and GE's Innovation Lab, and been written about in Harvard’s Nieman Journalism Lab, and have support from a community of experts and advisers (see partners and contributors, below.) We have original stories ready to go into production and we’re ready to move past the prototype phase. Contribute whatever amount you can. In exchange for your tax-deductible contribution, you’ll be given exclusive, advanced access to the stories and products we develop. And, you’ll get to choose from a list of great gifts and rewards from members of our team, including books, art, cd's, and workshops. Tell your friends, family, and colleagues about this campaign, through Facebook, Twitter, or old-fashioned word-of-mouth. Our goal is to raise $35,000, which will help us build the Newsmotion interface and enable us to move into production some of the projects we are already working on, including a stunning first-hand account from inside the Rwandan military intelligence revealing unreported information about the genocide, by Italian novelist and journalist Lara Santoro; and a story about non-violent resistance and social change featuring Newsmotion adviser Todd Gitlin and Srdja Popovic, a leader of the youth movement that brought down Slobodan Milošević. In addition to receiving one of the great rewards listed to the right, your pledge will help support a more free, reliable, and innovative future for journalism and non-fiction storytelling. We are proud to have a talented and award-winning team of contributors, including including Egyptian journalist and author Yasmine El Rashidi (The Battle for Egypt); independent journalist and former Harvard Nieman Fellow Monica Campbell; 2011 Stanford Knight Fellow and founder of Peoples Production House, Deepa Fernandes; writer, scholar, author and chair of the PEN literary organization’s translation committee Susan Bernofsky; multimedia producer Shreeya Sinha (Asia Society; Mediastorm); independent journalist Milton Allimadi, (Black Star News); photojournalist Alvin J. Báez (VISO Photo); novelist and independent journalist, Lara Santoro; and independent journalist Jessica Lustig. The Environmental Health Clinic at NYU, a science and technology lab that designs and deploys innovative solutions for environmental health; REV-, a non-profit organization that supports and produces socially engaged art, design, and education; Sourcemap Foundation, a non-profit research organization dedicated to understanding the fundamental issues at stake in global logistics; The International Information Policy Foundation, working to protect free speech and define information policy at the global level; and Pachube, an open data web service that will enable us to use citizen-sourced measurements of the world as a storytelling tool. Signed DVD ofNewsmotion adviser Laura Poitras's Academy Award nominated documentary "My Country, My Country," an intimate portrait of Iraqis living under U.S. occupation. Plus, an original ballot from the historic 2005 elections chronicled in the film. Yes Men's SurvivaBall suit: a collectible 5" rapid prototype, the only one of its kind. Made from the model used in the Yes Men movie, and currently in the Yes Men's personal collection. Award-winning books and cd's from the Newsmotion team and friends. Limited edition of The Occupied Wall Street Journal Issue #4 Poster Folio produced in collaboration with The Occuprint Collective, and "Wild and Neglected Like Me," a limited edition screenprint by Molly Fair and Jesse Goldstein. 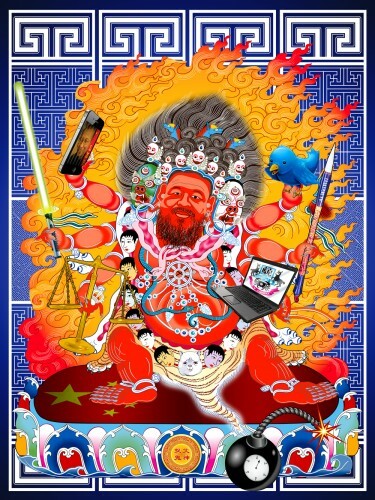 Kenneth Tin-Kin Hung's “Ai God Catching Ghost”– a 36”x46” print of Ai Wei Wei on premium archival photo paper, edition 2/5 of the paper edition, from his series on Internet censorship in China, "The Travelogue of Dr. Brain Damages." “Superfund 365: Hunters Point, San Francisco, CA”– a 11”x14” C-print by Brooke Singer, from her award-winning photo and online data visualization project, Superfund365, that highlighted a different toxic contamination site in the US every day for one year. Signed and numbered special edition print on 11x14 archival fiber based paper from Newsmotion photo editor Alan Chin, taken above the Gulf Of Mexico, June 2010, on board BP-contracted helicopter overflying the site of the Deepwater Horizon oil spill in the Gulf Of Mexico. A 13"x18" print by award-winning photographer Misha Friedman from his series "Donbass Romanticism" on life within the industrial complex in Eastern Ukraine. "Help Me Help You Help Me Love You" - Limited edition 5" x 7" screenprint by Jesse Goldstein. Your choice of a limited edition print by photographer Jason Goodman, like this silver gelatin print of actor James Franco from the pages of Vanity Fair. Visit http://www.photosjg.com/ to see more. Will Dailey's latest album, "Will Dailey and The Rivals." Newsmotion is a non-profit venture and your donation is tax deductible. All funds will be administered by Big & Lil Marsh Productions, the 501(c)3 that is our fiscal sponsor for this project. Julia Haslett, Oskar Landi, Sebastian Pinzon, Monica Cohen, David Degner, Michael Williamson. Welcome to the team! You'll get access to exclusive updates about our progress, and you can continue to support us by spreading the word. A Newsmotion sticker designed by artist/writer Marisa Jahn. An original first edition copy of The Occupied Wall Street Journal. A copy of the special, limited edition of the New York Times, produced by the Yes Men and hundreds of other independent writers, artists, and activists. A spot on the guest list at our Winter Gumbo + Apple Cider Martini Party (details to be announced). Making a Kickstarter pledge at this level or above will automatically put you on our list. And if you’d like to support Newsmotion but can’t attend the event, please consider buying a ticket to sponsor a starving artist or journalist who would not otherwise be able to join us. An exclusive sneak preview of the Newsmotion.org platform, with a beta invitation to test the site. A signed copy of signer-songwriter Will Dailey's latest album, "Will Dailey & The Rivals" - plus a preview of the rotoscope film-in-progress starring Will, Julian Rubinstein, Alan Chin, Alia Malek and Milton Allimadi. Signed copy, personalized to you, of Newsmotion Advisor and chair of Columbia University's PhD program in communication Todd Gitlin's book, Letters To A Young Activist. Earlier this year, Newsmotion adviser Todd Gitlin visited Belgrade and met with Srdja Popovic, a leader of the Otpor movement that helped to overthrow Slobodan Milosevic. You’ll get special access to their extended conversation about social change and non-violent resistance, produced by Newsmotion.org and photographer Matt Lutton. A signed copy of 'Byproduct,' a limited edition book edited by Newsmotion creative director Marisa Jahn investigating artists embedded in science, industry, and electoral politics featuring artists and thinkers such as Claire Bishop, The Yes Men, Billy Kluver / Experiments in Art & Technology (E.A.T. ), Artists Placement Group (APG), Joseph del Pesco, and more. A signed copy of 'Targeted: National Security and the Business of Immigration,' by People's Production House founder and 2011 Knight Fellow Deepa Fernandes, with a forward by Howard Zinn. A signed copy of Julian Rubinstein's 'Ballad of the Whiskey Robber,' about the Hungarian bank robber and folk hero Atilla Ambrus, along with the limited edition audio cabaret production of the book, starring Eric Bogosian, Jonathan Ames, Gary Shteyngart and others. A signed first edition copy of the Pulitzer Prize–winning book 'And Their Children After Them' by Newsmotion adviser Dale Maharidge and photographer Michael Williamson. We're taking your calls! It's your chance to get a professional consultation about your project, debate the future of the media, or just shoot the breeze with a member of the Newsmotion team. “Superfund 365: Hunters Point, San Francisco, CA”– a 11”x14” C-print from Brooke Singer's award-winning photo and online data visualization project, Superfund365, that highlighted a different toxic contamination site in the US every day for one year. A collectible 5" rapid prototype, the only one of its kind, of the Yes Men's SurvivaBall suit. Made from the model used in the Yes Men movie, and currently in the Yes Men's personal collection. "Haiti, Saut-d'Eau Festival"– a 13”x19” ink jet print on 325 gsm Hahnemuhle archival paper by photographer Jake Price (image coming soon). A customized, four-hour multimedia training led by experienced instructors from PPH and Newsmotion. You're either a corporation or an individual with a love for storytelling and a desire for a tax deduction. So long as your cause or company isn't offensive or inappropriate, we'll give you a full sponsor treatment, including major sponsor credit and signage at our next big event, a speaking slot during the event, social media thanks and introductions, and sponsor presence on feature content.